Everything which doesnt fit under any other menu item you will find, for the time being, on this page. Addendum Q of The Racing Rules of Sailing - an Addendum to Sailing Instructions for Umpired Fleet Racing and, in particular, for a Medal Race. For the latest version check the ISAF Site. Check your knowledge. Try this test, to be sure you understand Addendum Q: . Use risk management methods to optimise your strategy and tactics. In any modern led company, Risk Management is one of the most important management themes today. According to Wikipaedia, risk management means to identify, to analyse and to evaluate. If we analyse races we can see again and again that sailors tend, despite their experiences, to use strategies and tactics which are highly likely to lead to a poorer placing/result. Who doesnt know the sailors, who can always be found on one of the laylines at the cross? The ones who are first to jibe on the downwind leg and sail away from all the others. Of course there is a small chance that their strategy will work and that they achieve an extraordinary improvement in their placing. Probably the chosen strategy has sometimes been successfu and they remember exactly that if they always decide on a high risk strategy. People tend to forget failures; that's why memories of bad crosses are pushed aside - they simply don't remember how often several places were lost by choosing a high risk option. This behaviour pattern is comparable with Casino visitors who do know that long-term they will always lose, but the chance of a quick win over-rides reason and leads to them repeatedly trying to get lucky. Regatta sailors who follow this pattern sometimes win the odd race, which they relate for years on end at the Club Bar, until at last, after many failures, another success finally comes. Another behaviour pattern of many regatta sailors is to avoid any risk whatsoever. These sailors always start in the second row, avoid every battle, and as a result are not only always found at the end of the lists because there are always a couple of 'Player' types too. If one freely gives up on any battle, and loses a couple of places when turning around each course marker, they will eventually find themselves at the back of the field. We know now, that in order to be successful we cannot avoid all risk. Conscious acceptance of risks is, in any case, a condition for the chance to win places on the racing course. Through increased knowledge and evaluation of your risks you will be able to take on more and realise the chance to win places, without suffering irretrievable damage (loss of points) because of too much risk. In each of these cases we should be aware of risks/chances, how likely they are to occur and to weigh them up against one another. Which risks we will take is dependent upon the situation and our objectives. We should however be aware at all times which risks we want to take and why. We do that naturally of course, without thinking much about methods. Here's an example: in a competition where a void result is expected, everyone who already has an OCS or DSQ in their results avoids big risks in the Start phase or in duels. Top sailors instinctively choose a strategy based on observations and experience. They instinctively evaluate all the risks which could crop up on a leg of a race and pull all their own observations, information from the trainer, and available course and weather information into their risk analysis. They calculate whether a certain tactic could be successful and also take into consideration that it could go wrong. They always have a Plan B at the back of their mind – what would be the consequences if it goes wrong? Consider which alternative courses of action you have in a certain situation. Sort all optional courses of action according to the chance of gaining places. Evaluate the risks of the various options. Choose the option which will give you the greatest chance of gaining places but with risks which are nowhere near the unacceptable range. Sounds quite simple but how does one determine the 'unacceptable range'? The risk diagram helps you to recognise the unacceptable courses of action and to cut them out of your strategic consideration in future. Here is an example of a risk diagram for the tactical decisions before a Start. By 'loss' we mean the loss of position that we expect if something goes wrong. Green – generally acceptable area. In other words, we should always move in the green area in our tactical decisions and avoid the red area. Alternative courses of action in the yellow ALARP area (as low as reasonably practicable) should only be considered if there is no better alternative. In certain situations, the evaluation of the expected benefits of a decision can, after careful consideration of an alternative course of action, lead to choosing an option from the ALARP range. 'Start in the optimal position' is something which at first sounds sensible, but which appears deep in the red area of this risk diagram, on the one hand because the loss if the manoeuvre fails can be very high, and on the other because the probability of occurrence of this loss is very high. We have evaluated probability of occurrence as well as the possible loss very high in this risk diagram. We get disqualified for breaking a rule. We dont manage to get to the optimal position and start from the second row. A lee boat is too close to us after the Start and we cannot accelerate to our optimal speed. I find that is a great deal of possible losses and that banning the strategy of 'Start in the optimal position' above is justified. Now let's look at the likelihood of occurrence. Why do we estimate so highly that there will be a lot of damage. Not only we but also 80% of the starters think that this one starting place is optimal. This means there are many competitors for the one starting place. Risk diagrams lend themselves brilliantly to the communication/visualisation of risks in discussions between athlete and trainer. 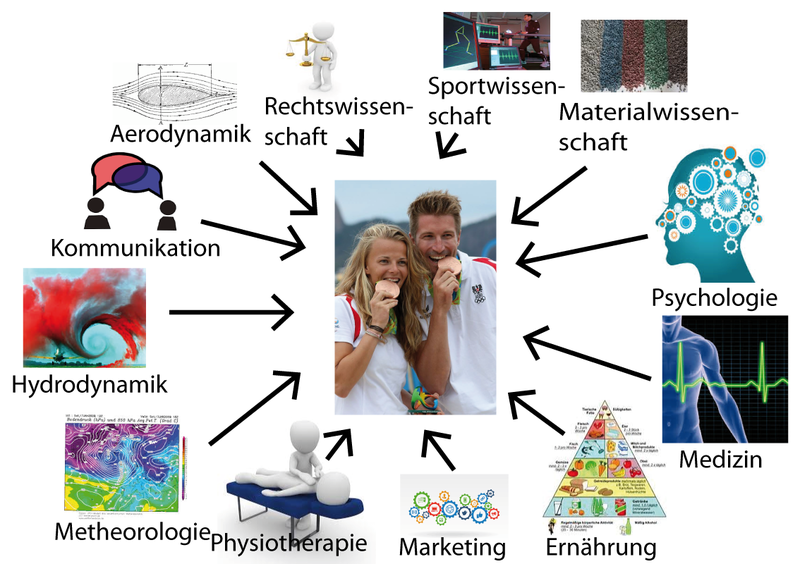 With the aid of risk diagrams you can raise the athletes' awareness of risks. In the download area you can find an Excel template which you can use. The evaluation of the various tactics should be made with your Trainers, team members etc.. Depending on the Team Skills the risk diagram will differ even with the same tactical variants. Even during a regatta series, the assessment may shift. Risk evaluation is a dynamic process. What I mean by this I will explain, again using the above example 'Start on the optimal position'. Only after weighing up all these factors can I judge the likelihood of a bad Start, but also the damage a bad start could cause. The more you get to familiarise yourself with the theory of risk evaluation, the more automatically you will make the right decisions in a race and avoid unacceptable high risks. .
Our competition is far from over when we cross the finishing line. How can we get some benefit from the experiences of the last race or from the race day? After a race there is an initial assessment of the result. If it all went well, our self-confidence will get a boost, and we will automatically go into our next race feeling stronger. However, what if the race was average, or even went badly, how can we deal psychologically with a bad result? How will we motivate ourselves for the next race? At a moment like this, a psychologically qualified trainer on a motorboat would be a huge advantage. But, even without a trainer, we can do several things to motivate ourselves for the next race. If you arent alone on the boat, you should review the last race with your fellow sailors. If you are alone, you have to do it all yourself (but that has at least the advantage that no-one can disagree with you!) In any case, move away a little from all the hubbub, try to find the quietest place possible and reflect on how the last race went. What was positive, what was negative. Where did you lose unnecessary places and why? Tip: Don't get lost in details. Try to single out one or two errors which you want to avoid in the next race. Then think of the positive experiences in the race before, and as it would have been if you had not made a two big mistakes. Then think about the positive experiences in the recent race and it would have been if you hadnt made two big mistakes. So what is there to stop you aiming for an even better result in the next race? You know how it is, you have a plan and you wait hopefully for the next Start, because you want to show your ability, and you know that you arent going to make the big mistake you made in the last race again. The race day is over, your boat is ready for the next day, you've showered, you were at the blackboard (notice board) and dont have to prepare yourself for any protest hearings. Now its time for a thorough de-brief with your fellow sailors and Trainer/helper. Each individual part of the race should be repeatedly and thoroughly discusssed. Don't just concentrate on errors, its important to discuss successful moves too. After all, you want to repeat the good moves as often as possible. 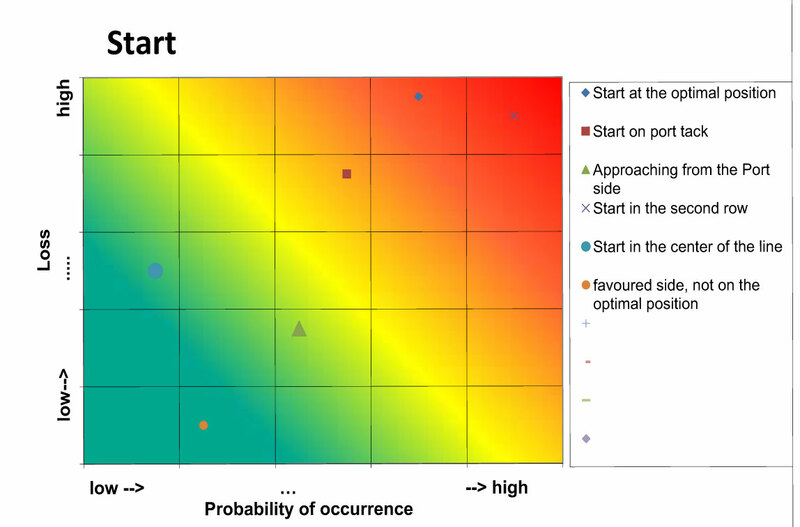 Place great value on recognising what the optimal path in the individual races was, and how you recognised them, or how you could have recognised them. Of course its easy to say, after the event, what the best tactics for a race would have been, but could that really have been recognised during the race? Did you throw clear indications to the wind? You cant always know why one thing works and others don't; it doesnt matter. Concentrate on the sections where you realised what was good or what was bad. Try to avoid recognised mistakes in the future and to repeat what was good so often until it becomes automatic behaviour. Some (bad) Trainers try to distinguish themselves which statements like 'Of course you could see that' or 'that was obvious'. You can counter this quickly by asking exactly how one could see that, and why something was so obvious. You should never avoid this discussion. Often the perception from the Regatta boat is completely different to that from the Coach's boat. A dicsussion about these two realities can help to judge the situation better the next time. Dont forget to note all your conclusions in your 'Sailing Diary'. Your memory, and also that of your coach, is not limitless. You can keep a lot in your head but sometimes it is better to research your own database. These are available in many different types and you will be familiar with them from protest hearings. Jury members use them to reproduce a situation on a regatta course. Most of these will be provided by the Jury, but only very few sailors have some in their regatta luggage. 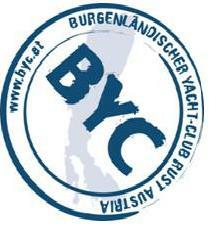 Usually coaches and sailors use cigarette boxes, Bic lighters, salt pots or similar objects to represent marks and boats. It is much more professional to reproduce situations with the model boats and also to document them with a mobile phone camera. Make sure that the boats are magnetic. Model boats with a magnetic hull stick brilliantly to Flipcharts (you just need to remove the paper). This enables you to present to larger audiences effectively also. The air gets milder, the snow melts, Skis or snowboard will be put in the corner, because the real passion, (Regatta) sailing again becomes our main topic. 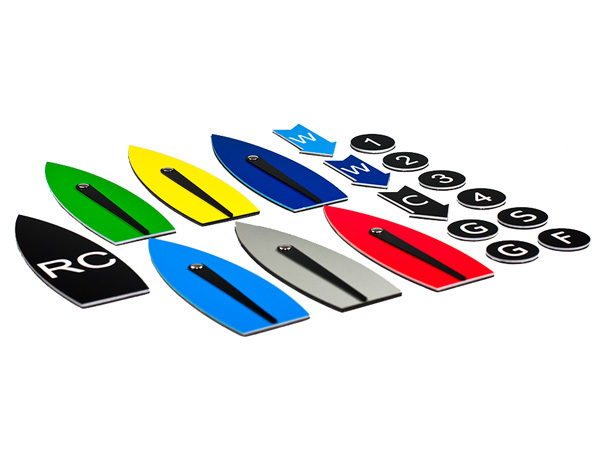 What kind of mistakes should be avoided, and what are the most efficient first steps on the water in the new season? Time is short before the first Regatta! Carry on with ski gymnastics as sailing gymnastics! - Fit is fast! Set goals – preferably draw goals from analysis of the previous season (e.g. „We don't want to lose speed when tacking“ – measurable, recordable (e.g. with Velocitek) and therefore objective, or „We want, if the start line is favoured to the left, to win 80% of the pin-end (to be the boat next to the pin end mark)". Record all goals (write them down!!!) so that they are there for the competition preparation and are available for analysis after the season! Agree goals with the whole Team and document them! Recapitulation of the Rules working through unclear situations from the previous year (in any case get the Team together, possibly with a Professional). How can I make the boat as light as possible? The most important key for some extra speed. What made the most problems in the previous season? (the „automatic“ spinnaker halyard, the „never ending“ jib sheet) and why? – Take care on the KISS (keep it simple and stupid) principle! What systems did the (successful) competitors use? – Consider what are the best systems for your boat and your crew. Don't copy systems, if they do not fit to the competence of your team. 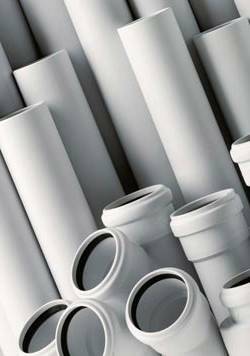 COMPLETE CHECK – not once, no twice- three times go through everything: Halyards, shrouds, sheets, blocks – of course this will be done after every (??? !!!) racing day, but before the start of the season it is particularly important to identify early and avoid possible weaknesses, (Why did the new jib halyard wear through again at exactly this point?, how many hours of sunshine does the PBO halyard have, etc.) – nothing is more annoying or unnecessary than even one point lost due to a (possibly avoidable) material failure. Are the underwater hull, the trailing edge and, above all, keel and rudder in perfect condition? All foils should be meticulously checked and – if necessary – optimised! – NO EXCUSE! What has been changed - sheets, halyards, shrouds, etc.? Do the Reference points from last year still apply? e.g. a new boom vang is – despite all accuracy– not going be exactly as long as the old one, so the measuring marks needs to be CHECKED – otherwise you could be extremely frustrated because the boat doesnt move like it did last year. Deduce „Training hot spots “ from the goals you defined earlier. At every level, and under all conditions, boat control (e.g. always to be able to carry out every manouevre) and sailing technique (e.g. to keep constant heel in all conditions) are the important keys to success. Run through the processes (on Land and/or slowly (!!!) on the water) – is everything running smooth, or can you localize some hitches? If so why? Sequence structure communicated, defined and implemented? Playbook is helpful here – its always helpful to have a standardised order of play to hand (which can and must constantly be further developed!) of the individual manouevres– NEVER, to put the blame on someone when something goes wrong, but in order to delegate tasks and responsibilities and ABOVE ALL to know who has the time and the opportunity, when a mistake occurs, to put them right. Analysis (Video on boat? ), room for improvement? Analize videos of succesful competitors. 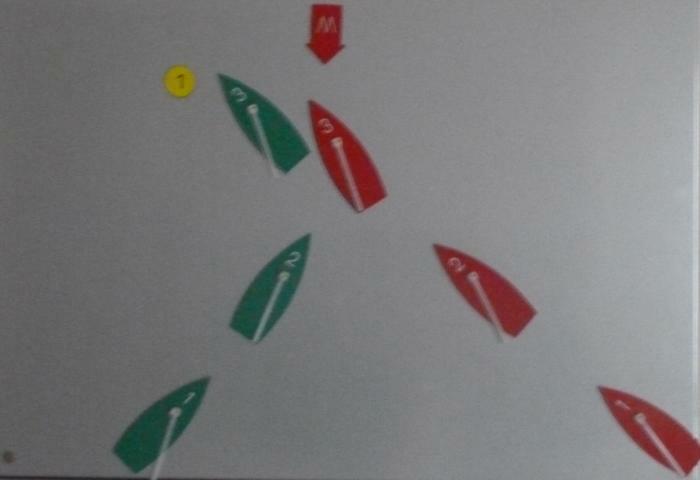 Important in every Class: Acceleration at the Start and from manoeuvres (tacking, jibing, mark roundings) - Exercises for this: Figures of eight sailing around two buoys (tack and jibe). Boat control: first manoeuvre slowly, then as a first step up around marks, and then with more stress (shorter course, practice all possibilities – even if they 'never' happen (e.g. tack-gybe-set and gybe-drop-tack). 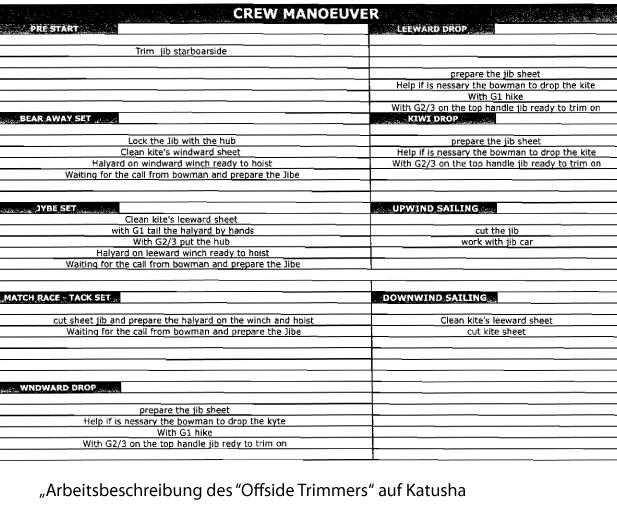 Important to note here: Rhythm of the team in manoeuvres generally - to move as one person, „blind“ mastery of the processes. Indispensable: Compare with (open, honest, focussed) Training partner, if possible with an observer (Coach) from outside. – ESSENTIAL: Objectify and record results. Timely choice of the „No. 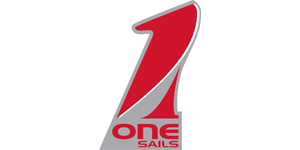 1 sails“, of the Base Settings und Cross Over areas of the sail(s) – and then trust it (even if evolutionary). Sail with 100% effort every minute on the water! Make a strict difference between sailing and pausing ! Remember to keep the fun and pleasure in your sport! The following lists were compiled by successful Coach, Adolf Pelinka. A good RIB, a good motor/engine, enough fuel; most coaches pay attention to those. But what about the rest of the equipment? What else belongs on the RIB, and what is unnecessary? The following list is in order of importance. Knife and Wire cutter Safety Can save lives From a specialist supplier, but they must be tested daily! MUST NOT BE RUSTY! 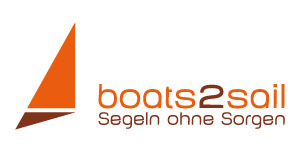 Speedy und direct feedback, as well as the Chance also to get information immediately from the Boat. look for one with the IPX7 waterproofing standard! The other side of the course, wind etc. Flow meter - self assembly using water pipe (http://www.bosy-online.de/Rohrleitungen/AS-Rohre.jpg ) and a swimming aid (http://www.filimo.de/pool-nudel.html ) balanced with weights from a diving shop, which only appear 2-3 cm above the water surface. Reflex camera Documentation of the view from outside Retrieving the settings, and help with sail design Focal length 300mm, and preferably with Telezoom rather than a fixed focal length. But that's not enough. For effective training work we need a few more things on our protegés' boats. For use with several boats: Analysis of races possible. Unlike most other sports, self control is important when sailing We are responsible for obeying the rules. If someone doesnt stick to them, he will usually not be punished by the judges; the responsibility, in most cases, lies with us. You will certainly already have lost one protest decision or another, even though you thought you were in the right beforehand. Work on the assumption that your story is completely different to that of your competitor. This is nothing to do with unfairness or deliberate lies, but with subjective perceptions. Your opponent and yourself have different views, different perspectives - distances and times can be perceived differently due to being under stress. On top of that, everyone tries to leave out of their account of the situation, anything that would be a disadvantage to them. According to Racing Rules of Sailing Rule 63.2 sufficient time must be allowed for the preparation of your protest. You decide what sufficient time would be, and not the Jury. Use the time and consider your story carefully. Write down key words and test your story for plausibility. Its always good to know the other side. In the Judges' Manual you will find guidelines and tips for the Jury. Pay attention especially to Appendix 6 (Speed Table) and Appendix 7 (Boat Speed versus Distance Tables). 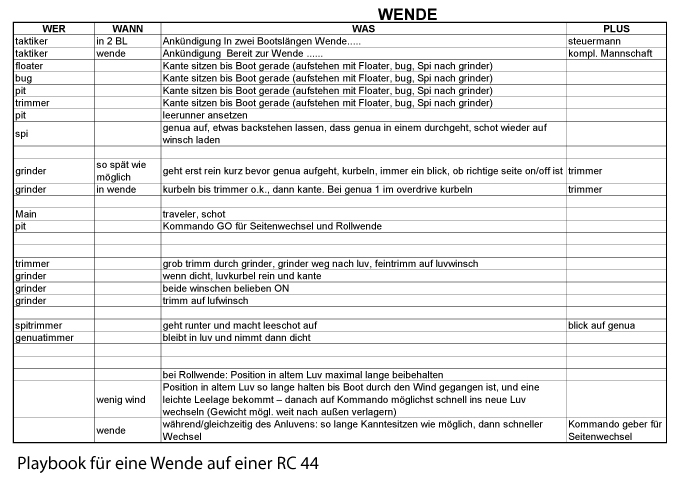 Jury members like to use both these tables to verify statements by parties or witnesses. Always be prepared for questions such as 'How many seconds passed between the incident 'x' and the result 'y'?' or similar. Not just a lyric from Georg Danzer; it should be your motto in a protest haerring situation. Do not react emotionally to the statement of your opponent - always remain objective. Statements from Jury members can also be exasperating. It is, however, counter-productive to get upset about it; your aim must be to get a good result from the negotiation, so keep your emotions in check. If you are of the opinion that a witness hasnt told the whole truth, try to show he is unreliable with your questions, and to catch him out with contradictions. The witness was, after all, not present during your opponent's statement, so try to cause him to make statements which contradict those of your opponent. Even if the result of a hearing does not meet your expectations, you should accept it. There is only one exception: If the Jury uses the Rules incorrectly, you don't have to accept it and you can go to appeal. There is no sense in going to an appeal because the story accepted by the Jury does not agree with your version. It is in good taste to exchange at least a couple of pleasant words with the other party in the protest, or to drink a beer together, simply because protests are nothing terrible and belong to/are part of our game. The good relationship to our sailing friends should not be thrown away because of a protest. You are still often out on the course together and will still sail in many Regattas together. Sailing is much more fun if the atmosphere in all sporting rivalry is good. are compromised weather statistics, which can be read on a computer using Gribdata viewers or diverse weather routing software packages. The Gribdata is based on computer supported prediction models. The best known of these are Grib.us and zyGrib. places operate servers which any internet user can search for weather data for a particular area. The appropriate Gribfile will then be produced on the weather server and downloaded onto the computer. What data is available? The most important for us is data on wind; the wind strength and direction is given for every zone. Also available is information on temperature, air pressure distribution and rainfall. The illustration, left, shows a screen shot of GribFiles seen with the US.Grib Viewer. Especially if Appendix P is included in the sailing instructions , you should know exactly what is allowed and what is forbidden. To get you in the mood, here's a little quiz. If you can do it without a mistake, you dont need to bother with this chapter any further! Now, as temperatures climb again, it is important to call to mind again how important a regular intake of fluids is to be able to maintain performance capability. Mental tiredness increases, attentiveness and concentration decrease. Decisiveness is impaired. This has negative effects on our tactical decisions. Distances and angles are harder to judge; particularly, if the course it is narrow somewhere, the probability of reacting wrongly increases. The cardio-vascular and central nervous systems are affected, causing an increased pulse rate, lower blood pressure and loss of muscle strength. Physical tiredness leads to lower performances in all areas; all movements become subjectively more strenuous. Even a reduction of the body mass, caused by lack of fluids, can reduce muscle strength by up to 6%. An 80kg sailor only has to lose 1.2 kg in order to feel negative effects on mental and physical performance. 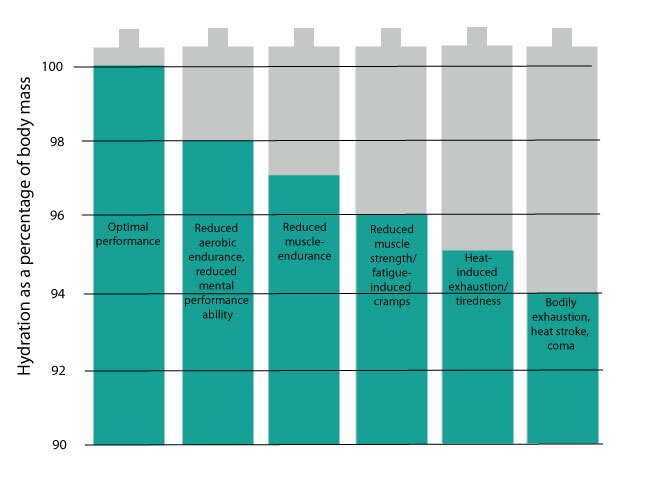 Even with light physical effort under moderate conditions (18-22 deg) the rate of perspiration equals 400ml per hour. If we assume the sailor is on the water for 2 hours including the journey to the race and waiting time, even before the first race of the day starts, the critical limit of 1.2kg will be reached already by the end of the first race. Normal sailing clothing, and sailing in warm areas, heighten these effects. Recent research results confirm that light dehydration can affect the mood, the energy level and the ability to think. According to the opinion of hydration experts, our sensation of thirst does not occur before the body mass has reduced by 1-2%, and dehydration has already begun. At this stage, our mental and physical performance are generally already lowered. The Coriolis effect explains many phenomena that we can notice when sailing. For example: If I sail close-hauled in the direction of the land, the wind will turn to the left (in the Northern Hemisphere). I think, if you have seen this video, it will be easier to note the many tactical rules which can be explained by the Coriolis effect, and to use them intuitively . We dont want to concern ourselves with the large air movements on earth, on which the Coriolis effect naturally has big effects, but with the smaller scale effects which we can see on the Regatta course..
We know from the previous chapter that the Coriolis effect drives the air streams in the Northern Hemisphere to the right. We also know that resistance is significantly influenced by the earth's surface. 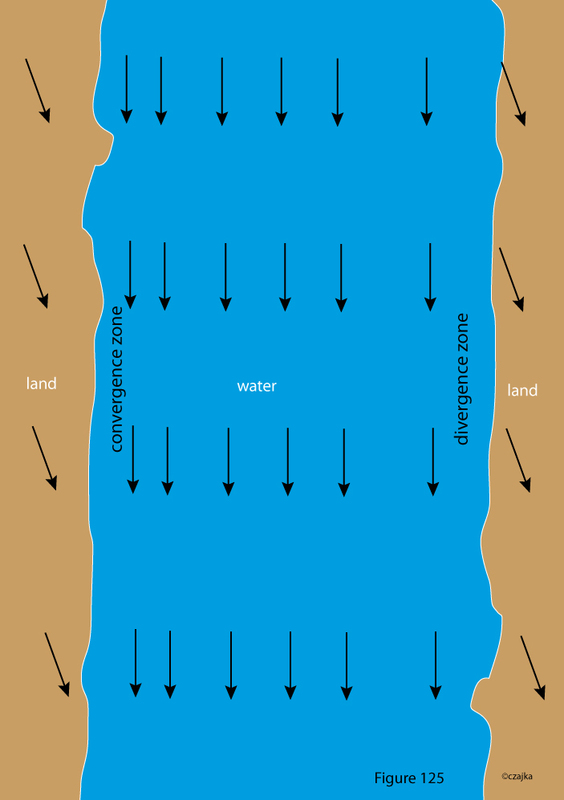 The resistance of a land mass is significantly higher than the resistance of a water surface. For this reason the diversion of the wind by the Corolis effect over land, is less than over water. 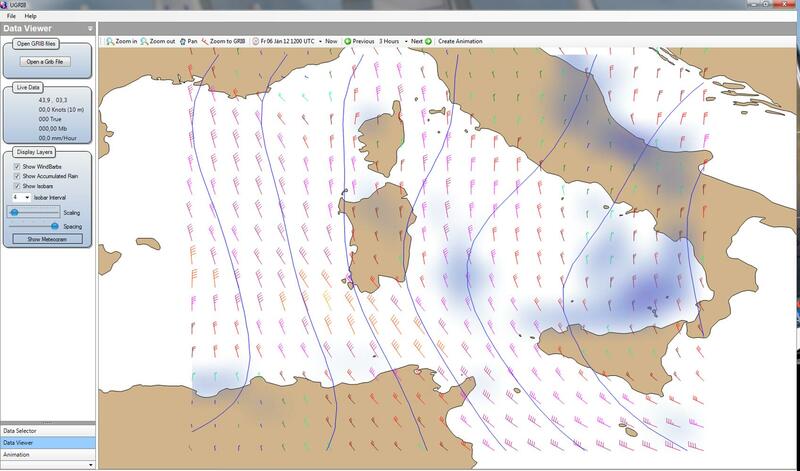 The wind is also diverted less to the right over land than over the open water surface. What can we learn from this for our Regatta tactics? Because we often stay close to the shore when Regatta sailing, let's look at two situations in detail:. If the wind is coming from the land it will turn to the left the nearer we get to the shore. For this reason it will be better to sail first on starboard on the left hand side of the course and, after the tack, with that lift to sail to the weather mark. It can clearly be seen on the illustration, that the boat which sails first on the left side of the course, travels the shorter distance. .
After rounding the weather mark on the downwind, you should naturally sail on the side where the upwind course was better. Therefore, sail the first beat with the wind from right to right side of the course (from the sailors view). So if you then have to luff due to the wind shift, jibe and you're in a deep angle to the leeward mark. Let's remind ourselves that the Coriolis effect pushes the wind to the right and that it is weaker over land than over water due to the higher resistance over land. In illustration 125 we see the air particles moving towards each other on the left side. A convergence zone forms. On this side you can therefore expect more wind. On the right side the wind arrows move apart. A divergence zone forms. On this side we must expect less wind. Naturally these effects occur also, if we only have land on one side. The following table shows us what we can expect if the wind blows parallel to the shore. The Coriolis effect is of course only one factor that you need to be aware of when sailing near the shore. 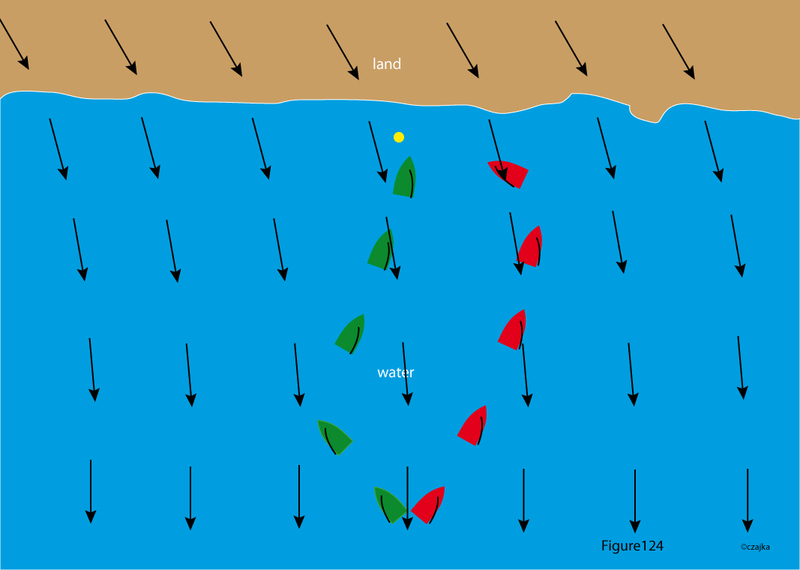 The Coriolis effect can cause wind shifts of up to 30 degrees, however precisely in the shore zone there are still many other effects to be aware of, and these can supersede the Coriolis effect. Look at the coastline, the buildings and naturally also the clouds. If there is a cloud on the right hand side of the course, it probably isn't sensible to sail to the left, and to rely on the Coriolis wind-shift, while on the right your competitors pull by with the puff out of the cloud. The distance you can recognice these effects depends on many different factors. The best thing would be to check before the race as you sail out, or send the Coach there. The effect can even be so extensive that it stretches beyond the size of today's short Regatta courses. In this case you can't even notice any wind changes due to the Coriolis effect. The wind blows to the right over the water. The approach to a weather mark near to the shore should therefore be from the right side of the course sailing on starboard to the mark. All the other considerations which we have put together in this chapter, therefore naturally only apply to the Northerm Hemisphere. 'Competition golf is played between the ears'. 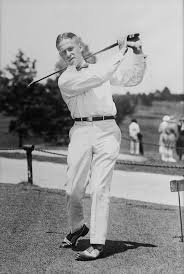 This quotation from golf legend Bobby Jones can be applied to every complex sport and, as we know, competition sailing is one of the most complex types of sport that there is. In top sailing. the differences in boat technology and competition tactics are very narrow. Many competitions will not be decided by rational thought and better technology, but also by mental strength. Even more races will be lost 'between the ears'. My trainer once told me, at the beginning of my saling career, after I gave away a victory at the final leg, ''You will only be really good if you get nervous if you find yourself in the second half of the fleet' Who doesnt know them, the types who begin a Series with good results, a place on the podium is within reach, and in the last Finals races, they sail uptight and nothing works any more. What can you do, if you recognise yourself here? Naturally the best thing would be to work with your own mental trainer, but not every mental trainer is right for every athlete. There are no 'best' mental trainers – you have to trust your mental trainer! Only then will you speak openly with him or her, so that they can help you to improve your results with better mental strength. Not all sailors can afford a mental trainer, so here are three tips that you can easily implement and which will perhaps help you to gain the mental toughness that you need to bring optimal results . What does a Success Diary bring you? A Success Diary alerts our consciousness to our strengths, improves our self confidence and records our achievements. Apart from that, it makes you feel good if you have a look through it now and then. Imagine your success and it will become reality. Imagine problems and they will become reality. 'Strong winds are forecast for tomorrow. In the last two races I capsized in strong wind'. If that is in your thoughts, the capsize is already pre-programmed. You must think positive and imagine good things. Only this way can you improve your mental strength. 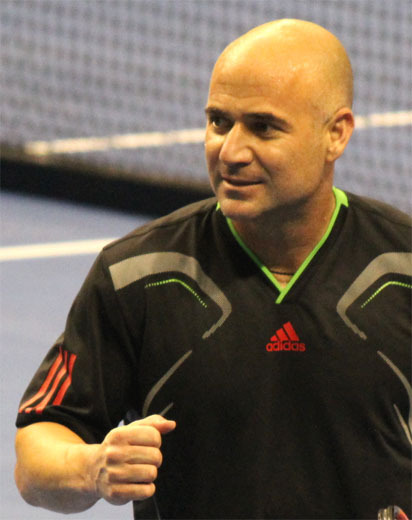 Andre Agassi said, after his first Wimbledon victory: 'I have already won Wimbledon 10,000 times in my head' In 1987 that became reality for the first time. The best thing would be to use the time just before you fall asleep to imagine how you have your opponents easily under control and that, to the cheers of the onlookers, you are sailing as winner over the finish line. But even long car trips are ideal to develop positive thoughts; playing through perfect manoeuvre sequences or tactical variations in your mind. There are a great many mental training books. Take a half day to go into a big book store and browse through all the titles. The same thing applies to a book as to a Trainer – you must trust the Author and the contents. So take your time and don't buy a few books online which will then just get dusty on your book shelf. It doesnt matter what you do – do something . The most important thing is to make yourself aware that mental strength is just as important, or even more important, than all the other factors for success in top sport. Of course gut feeling or instinct in top-class sport has its place. Not everything can be explained by science. But first of all it is necessary to work out and to understand the applied scientific knowledge. This is particularly true for the extremely complex sport of sailing. After that comes personal feelings and your opinion. How can you be successful / more successful? Top-class sailing is more than just sailing. You have to take into account the assured knowledge from all scientific disciplines and integrate it into your training.